It’s a testament to the difficulty of healthcare reform and the power of the healthcare lobby that it’s able to make reform of Pentagon procurement look almost easy by comparison. But that’s how it’s turned out: at the same time that President Obama’s healthcare reform has been fighting through the congressional underbrush one painful subparagraph at a time, his defense cuts have practically sailed through. Remarkably enough, he’s succeeded almost completely in cutting back the weapons platforms he targeted earlier this year, and he’s succeeded so quietly that I’d pretty much forgotten it was even happening. Once the Senate voted in July to stop buying F-22s, Mr. Emanuel said in an interview, that success “reverberated down” to help sustain billions of dollars of cuts in Army modernization, missile defense and other programs. ….Military analysts said [Defense Secretary Robert] Gates, a holdover from the Bush administration, also aimed at the most bloated programs. 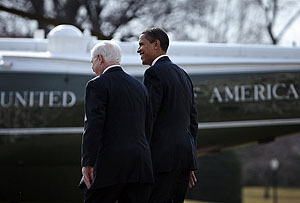 And Senator John McCain of Arizona, the former Republican presidential candidate, who has criticized the Pentagon’s cost overruns, provided Mr. Obama with political cover to make the cuts without being seen as soft on the military. Yes, Obama and Gates mostly took on only the most egregiously bloated Pentagon programs and then plowed the money they saved into other areas, which probably cut down considerably on opposition grumbling. Still, this is a landmark effort. Cutting even a single bloated program is usually the work of years, and to cut three or four at once is unprecedented. Having a conservative (and politically savvy) Defense Secretary like Gates carrying the ball for the program cuts was instrumental in getting them done, in the same way that having a conservative like Gates carrying the ball for ending DADT will probably be instrumental in getting it abolished next year. I was sort of ambivalent about the Gates appointment when it was announced last year, but I have to admit that so far he’s come through on the potential upside.